Choose your own Health Adventure! On Friday, October 26th, Thrive participants will experience a customized day of events in Canmore, AB. Participants will be able to choose one offering per time slot using their login details to sched.com. It is important to login in early, to guarantee their spots in the specific business’ offerings on Schedule.com! Featuring all kinds of wonderful food, body products, jewellery, art, clothing, tea…You won’t want to miss all the special products our purveyors of healthy wares have to offer!! Make sure to create your own customized Thrive schedule once you register for your weekend festival pass or Friday day pass! This class is designed to relieve stress and build strength. We begin with gently warming up the body and moving from one posture to another, finding a flow (often to music). We focus on proper alignment and connecting breath with movement. Stretch and De-stress is a great start for beginners, athletes, as well as those with injuries whose bodies and mind may need a little extra maintenance. Join us for a tour of our Canmore Workshop. You’ll see how we make our 100% natural products, start to finish, and get the chance to tour our different departments to learn about all the different aspects of our business. Come learn the wonders and experience the benefits of Classical Pilates. A traditional mat and weighted bar are supplied and all levels are welcome. Developed by Joseph Pilates in the early 1900s, Pilates is designed to Return you back to life! Experience proper alignment, breath, core strengthening and stretch in a full body workout experience. Class size limited to 12 participants so pre-sign up is a must. Sick? Tired ? Stressed Out? It features our Founder, Formulator, Chair and CEO, Jason Watkin. Jason is extremely passionate and has a background in Western Sciences infused with Eastern Medicine, ancient religion and philosophy. He will be speaking about our extensive medicinal mushroom line and mushroom formulas, including Complete 360, and touching on some other new favourite products too. Rediscover and reinterpret the traditional Korean Kimchi and fermentation techniques that have used by ancient sages around the globe for centuries. In this 1 hour workshop learn how to build your body’s natural flora and naturally improve digestion by implementing fermented foods into your diet. Consensio Clinic is offering 1 hour collaborative assessments and short treatments of 15 minutes-duration of Osteopathy, Traditional Chinese Medicine, Chi Kung and Therapeutic Recommendations. At Consensio Clinic we help transform the health of women, men and children of all ages through a variety of integrative techniques including osteopathy, naturopathic medicine, traditional Chinese medicine, occupational therapy and massage therapy using evidence-based tests, consultation, therapy and education. Our collaborative approach with other health care practitioners (both conventional and complementary medicine-based) allows us to offer the most effective care to our patients. Join Tara Newbigging at STUDIO b. for a mindful Ground & FLOW class. This class will ignite your senses mind body and soul. Simple yoga/stretch moves and awesome tunes, this class will open you up and leave you feeling free and clear. Using breath, mantra, movement and meditation we will explore a gentle activation of the root chakra while exploring its nature. Drop into the body and relax in the interface of consciousness and form. The practice is suitable to all levels of experience and is deeply internal and meditative. Participants require yoga mat, blanket, pillow, notebook and water. For those who purchase a Thrive Festival registration, I will offer this certification course for $50 off. This course is recognized by several fitness and health related organizations which provide continuing education credits, for example the Alberta Fitness Leaders Certification Association. 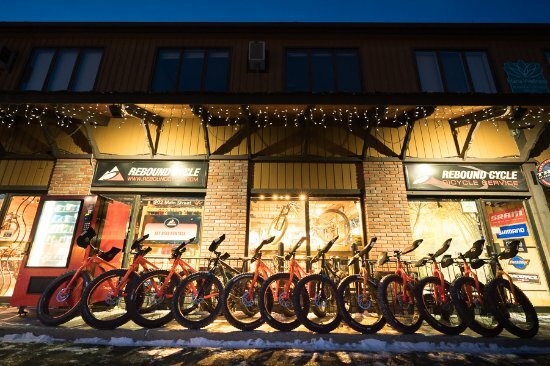 An informative clinic on the basics of winter riding in the Bow Valley and beyond followed by a casual fat bike ride along the Bow River / Participants will get a chance to ask questions that pertain to their individual winter riding situations ie commuting, excessive or multi day fat biking adventures. Stress has been identified as one of the leading factors contributing to illness and disease in North America. It affects everyone and it’s effects can be detrimental to our health. This informative seminar will provide you with ways to identify how stress may be affecting your health and provides lots of great strategies to counteract the impact that stress has on your health. 'An introduction to Emotional Freedom Technique (EFT) offers attendees the opportunity to learn an effective life skill that can be used time and time again. EFT involves gently tapping on ‘meridians’ on the surface of the skin, which are connected to your nervous system, similar to acupuncture but without the needles! Learning EFT gives you the power to release negative emotions as and when they arise, as well as giving you control over how you feel on a daily basis. Not only will you learn what EFT is and how it will benefit you but you'll also be able to practice within a group setting. Please note, within the workshop, attendees will not be expected to disclose painful memories or current problems, but instead use the benefit of working within a group to support each other as you work privately on your own inner thoughts and emotions. The workshop will finish on a relaxing note through the use of guided hypnotherapy. Join the creator herself, Tara Newbigging for an experience like no other. BooTy® is a barefoot fitness program that empowers and strengthens both the mind and body. The BooTy® program combines high intensity fitness moves with powerful music and movement, creating a perfect balance between intensity and fun. Participants walk away feeling strong and inspired. Seasonal foods and circadian rhythm Digestive health and its many ties to immunityImmune-building herbs and more! Come with your notebook and questions and enjoy a sample of a seasonal elixir that will tantalize your taste buds while it strengthens your defences from within. You will also have an opportunity to purchase key elixir ingredients after the class. Our brains are inundated with information and stimulation on a constant basis. We now have all the information in the palm of our hand with the push of a button but "it will push all your buttons." In the 60's Yogi Bhajan described this as "The greatest pressure on the human psyche." Today it is as important if not more important to meditate daily to clear the subconscious and strengthen our meditative muscle! Join us for a deep cleanse of the subconscious! A one hour class taught by Jeff Mah owner and inspirational Yoga teacher showcasing modern yoga methods and techniques popular at the Yoga Lounge. The class is all-levels and will be taught for anyone to attend. Resistance training for women has countless health benefits including increasing bone density, warding off age-related muscle atrophy and maintaining a healthy metabolism with hormonal changes; Yet women still live in fear that weight training will turn their bodies into something likened to Arnie’s physique! Join us in an experiential discussion showcasing the benefits of strength training and learn how to implement smart strategies in the weight-room to accelerate your goal achievement! Wear Comfortable workout clothing and water- be ready to move! Join Susan Hoy of Culinary Skills & Nutrition for a Conversations While Cooking Workshop. This demonstration style cooking class offers delicious samples of plant-based whole foods while you learn how some common foods we eat everyday effect your gut health. Discover what may be making the symptoms of IBS, Crohn’s and other Autoimmune conditions worse and how to make side effects such as bloating and digestive discomfort better by understanding the science of food additives. Recipe booklet included. Shinrin Yoku is used extensively in the Japanese wellness system. Research shows that time in nature helps reduce stress, anxiety, overwhelm and will increase focus, creativity, and overall wellness. This gentle model is ideal for all types of people and abilities. Level is easy. In this world in which you’re inundated daily by stress and pathogens, it’s useful to think of your body as a castle. The walls of the castle – your skin, bone and connective tissue – keep things out. Your mucosal membranes, genital urinary tract and eyes function like a moat. Inside your body is an army of cells, millions of loyal soldiers maintaining the fortress and multitasking as a self-defense system made up of archers, sentries, intelligence agents, communicators and armed guards. With daily attacks from bacteria, viruses and parasites, imagine how taxing it is for the protectors of our castle to keep our immune system strong and active. An underactive immune system makes us more prone to colds, flu, disease and infection. If our immune system is overactive, we can be left subject to allergies and it can potentially trigger an autoimmune response. As in our castle analogy, an optimal immune system is a balanced one. Join Kristen Stuart as she leads you through a gentle Yoga Nidra practice as she Journeys you through the depths of the subtle body, refining your senses as you become systematically aware of your inner body balancing between a state of consciousness. The crystal bowls played by Caroline Dalton will deepen this experience allowing the vibrations and tones of the bowls to move through the body, clearing, recalibrating and harmonizing the body mind and soul. Explore energy anatomy and the pranic forces that flow through the body. What is Kundalini? How is it activated? What does it do? Why does it matter? Whether you are super fit or just embarking on a fitness program, Nordic Walking is a perfect physical activity choice. Active by Nature exclusively uses Urban Poles for fitness walking and ACTIVATOR™ poles for older adults, persons with mobility issues, and persons recovering from injury. Ergonomically designed and strapless for safety, these poles are the best Nordic Walking equipment in Canada and endorsed by health practitioners across the country. Join Caroline Dalton as she guides you through a transformational gong bath. Within this healing journey, you will experience vibrational synchronization and prepare your body on an energetic level to fully support all upcoming challenges. The ancient tones and vibrations of the gong will transcend our entire being - changing our energetic field to allow for transformation growth and healing. This workshop is to help people identify toxicity and to learn strategies to clear toxins from all levels of the body, mind, and spirit. Time after time, I see how toxic influences affect my patient’s health and their lives and holds them back from living a healthy, happy and abundant life. Toxins impact our health on so many levels and can contribute to many of the health issues people experience like cancer, heart disease, digestive issues, immune system disorders, thyroid issues, sleep difficulties, weight gain, arthritis, hormone imbalances…this list goes on and on. I have also seen how a detox can change people’s lives. Whether you are an experienced detoxifier or you’ve tried and failed or you’ve never even considered doing a detox, this workshop will benefit you. Physical pain can create stress and may limit how you live your life. There are different ways that you can use your mind to control your pain. This workshop will focus on 1 of those strategies, eliciting the relaxation response, which is an antidote to the stress response in your body. You will gain knowledge and skills to help you cope better with your pain. Please note this is an educational workshop. You will be asked to not disclose any personal or confidential information in this workshop. Sign up for your 10minute one-on-one screening session. Choose one of the three taste testers and have an Active Life physiotherapist work with you one-on-one! Improve your running technique, make sure your bike fits you, or check your general range of motion to prevent future injuries. Your future self will thank you! Once registered online please email jenna@activelifephysio.ca to set up your 10min session. Are you finding that your memory isn't as sharp as it used to be? Do you experience periods of 'brain fog' where you have trouble thinking clearly and focusing? Experience an invigorating kriya to warm up and open the body for sacred sound current. Focusing on breath activation, we will infuse the body with prana and tune it with mantra. Prepare to feel uplifted and clear. The practice is suitable to all levels of experience. Wear comfortable clothing for movement, bring a yoga mat, blanket, pillow, notebook and water. Inner Mountain Meditation combines the challenge, adventure and excitement of a Rats Nest Cave tour with the calm and focus of a guided meditation. For Thrive participants you have the opportunity to participate in this special adventure for the special price of $45.00. The usual value of this experience is $129.00. Space is very limited for this event, so if it’s on your bucket list, don’t delay. Comfortable, warm clothing and appropriate shoes. Do you want to get fit for ski season? Then this class is for you! This fun and ski specific fitness class will be led by the clinic Physiotherapists (including an Olympian!) at Rocky Mountain Rehab. Wear work out gear and running shoes. Bring a water bottle and a yoga mat. All ages and fitness levels available. Interested in learning more about the world of medicinal cannabis? Do you have questions about the process? What is the “Access to Cannabis for Medical Purposed Regulations”? What is the difference between THC & CBD? Or wanting to learn just enough information for thought-provoking discussions with your friends? Come see us! How do the different types of injections work for joint pain? What alternatives there are to medications? What can the new generation of pain relief creams do, and how do they work? This interactive presentation from Banff Sport Medicine will answer these question and more. Sound Healing is a beautiful way to align self to your true vibration. The frequency that resonates from each bowl is unique. Made with the purest quartz crystal on earth, each bowl tuned to specific chakras and endocrine points in combination with rare earth elements and metals these bowls allow for healing on a cellular level. The pure tones interact with the crystalline structure of our blood, bones and DNA which promote the healing process. Physical injuries can be healed and old emotional traumas can be released. Sound Baths also make for powerful meditation experience. The sounds and vibrations allow you to completely focus thus guiding you deeper into your meditation practice, accelerating your inward journey. This state dulls the physiological sensory system and heightens the intuitive sensory system. One’s awareness shifts from “little i” auto-pilot ego-mind to “BIG I” awakened buddhi-mind. Tensions relax, stagnant energy and stress release, lung capacity expands, clarity and focus result as awareness makes its home in the cells. Elevated perceptions help make sense of cellular memory to elevate it to new perspectives. This is a profound practice and never the same twice. This practice is done lying down. Please bring items for comfort. SPECIAL REGISTRATION NOTE: Participants must be 16 and older. Those who are pregnant, please contact Angela to discuss participation prior to registering. Those who are experiencing heart conditions; glaucoma; or seizures are better suited to a private activation. Please contact Angela with any questions.